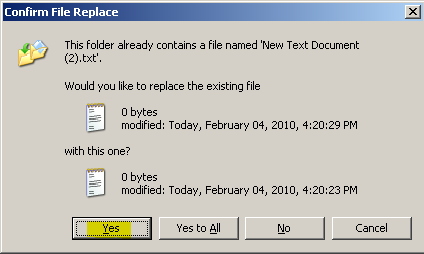 In Windows XP, when copying/overwriting multiple files, you could press Alt + A to copy/replace all. These keyboard shortcuts don't seem to be available in Windows 7. I have to press Alt + D then Tab, Tab, Tab, Space to get the same effect with the keyboard. Does anyone know of a keyboard shortcut to press the giant "buttons" on these dialogs? After thinking about it some more, I realized I could accomplish this with AutoHotkey. Save the following into a script and run it with AutoHotkey. The key combination is Alt + A. It simulates pressing Alt + D, Tab, Tab, Tab, Space when a window titled "Copy File" is active. NOTE: The IfWinActive function matches partial titles, so if you have this running and the title of the window has "Copy File" in the title, AutoHotkey will send the keys to that window as well. 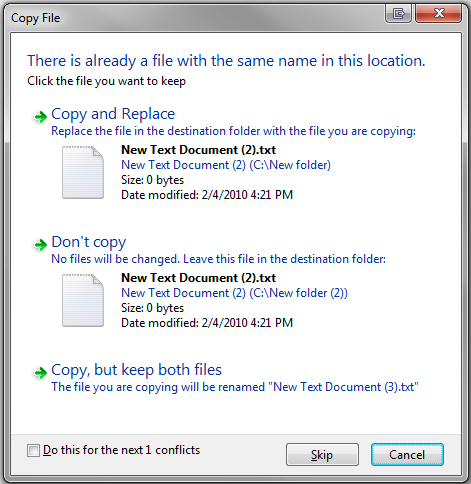 What is the difference between Skip and Don't Copy buttons in Copy File dialog? Where to manage keyboard shortcuts in Windows 7? Adobe Reader - What is the shortcut to enter the zoom level?